DC Comics's collection of the first fourteen issues of the 1990s series Resurrection Man is many things. Foremost, however, it may be a message in a bottle sent from an era that could be one day known as a golden age of DC's titles. Existing or coming in short order around the same time as Dan Abnett and Andy Lanning's Resurrection Man began were Chase, Hitman, John Ostrander's Spectre and Martian Manhunter, Mark Waid's Impulse, and Grant Morrison's JLA, and Starman was just completing its second year. These are comics that seem dated, but represented a certain amount of creator-driven, and yet continuity-based, creativity that lacks now in DC's line. This was a time of DC taking chances, with fan appreciation if not commercial success. DC released this Resurrection Man volume in conjunction with the New 52 Resurrection Man series by Abnett and Lanning; with the latter cancelled, it's unlikely we'll see a classic Resurrection Man volume two. The fourteen issues collected here, however, run the gamut of what an offbeat series Resurrection Man was, somewhere between The Fugitive and Dial H for HERO -- suspenseful, often droll, just a little scary, and with a good helping of 1990s melodrama mixed in. Aside from a three- and two-part story toward the beginning and end of this book delving into Resurrection Man Mitch Shelley's origins, Resurrection Man largely consists of single issue stories that find Mitch traveling from town to town, seeking clues to his old life and helping right wrongs in the process. Resurrection Man could very well be an old television show. Every time Mitch is killed, he's resurrected with a new power that just-so-happens to lend to the predicament in which Mitch finds himself. Two of the best examples are issue #8, where Mitch befriends a young boy and his monster-hunting father, and issue #13, where Mitch solves a case for a town sheriff. In the latter (illustrated by Mike McKone), Mitch is the victim of a serial killer, and his new mind-reading powers allow him to piece together that the killer also murdered the sheriff's daughter. After the sheriff takes revenge, Mitch volunteers to accept responsibility and go to the electric chair to save the sheriff's career. Bloody (though not by today's standards), horrifying, and weird, "Murder So Sweet" rings of a kind of EC Comics horror story, full of murder and sacrifice and secrets. Issue #8, "Tricks or Treats," in contrast, has a simple Silver Age feel to it. Mitch -- often dressed in a 1990s "tough guy"'s black hat and trench-coat -- takes pity on a young boy who's embarrassed that his father hunts Bigfoot, essentially. Mitch is gifted with shape-shifting powers, coincidentally, and he's able both to turn into a kid himself to help the boy fight bullies, but then also to turn into the monstrous "Howler" and save the father's reputation. It's a story that's surprisingly heart-warming given the dead-eyed skull-face on the front of this collection, and it demonstrates the versatility of Abnett and Lanning's un-killable, infinitely-powered hero. Indeed whereas the New 52 Resurrection Man is introduced in DC's supernatural "Dark" line, and the logo for the classic Resurrection Man has a fedora-ed Shelley in silhouette reminiscent of the priest in Exorcist, this volume is more often in the sci-fi/superhero genre than horror. The second issue has a compulsory appearance by that era's Justice League (complete with Electric Blue Superman); it's frightening when Shelley's mob-connected wife and business partner drug him with rat poison and then stab him repeatedly, but it's back to super-heroics when Mitch, armored like the Fantastic Four's Thing, takes on the mob. Though Shelley dresses like a goth idol, he was a lawyer in his former life, and there's some disconnect between how Shelley looks (or how a superhero needed to look at the time) and his general interests and demeanor in the story. It's surprising further that Abnett and Lanning never get into the psychological or spiritual aspects of Shelley being a "Resurrection Man," though this may come later (farther along, they teamed Shelley with Peter David's then-mystical Supergirl). By the sixth issue (a Genesis crossover tie-in), the reader senses Shelley's powers are science-based, and by the end it's clear Shelley is resurrected through "tektites" in his blood (what science and sci-fi would call "nanites" now). Never does Shelley seem afraid to die, worried he might not be resurrected, or even concerned about the pain of dying (Garth Ennis's Hitman having gassed, drowned, blown up, and run over Shelley is played for laughs). This is the direction Abnett and Lanning went and it's not wrong per-se, but there's an amount of angst missing in Shelley's resurrections that's surprising either for our time or the series's. Irrespective, while Abnett and Lanning's classic Resurrection Man is not "deep" necessarily, it's an example of some masterful storytelling. Another highlight is an issue set in Gotham City in which the authors seem to be writing Batman, and not Resurrection Man at all -- until it becomes apparent that the victim of all three of Batman's cases are Shelley. This kind of subtlety surely makes up for latter sequences where Shelley, dressed in uncharacteristic blue spandex, infiltrates a secret lab called The Lab and trades quips with a mad scientist called Mr. Fancy. Where series artist Butch Guice draws Resurrection Man at its least superheroic, it shines; when guest artists draw the super-nineties female assassins the Body Doubles (whose synonymousness with Resurrection Man I've never understood), Resurrection Man dips, only for a moment, into the same old thing. Still, what largely defines Resurrection Man (and Chase, and Hitman) was that at a time when superheroes were in their (relative) heyday at DC with the new success of JLA, Resurrection Man was a book that went the other way, with a (mostly) non-costumed protagonist and a genre-bending focus, closer at that time to something like Starman. There's not so much of that kind of thing out there right now, unfortunately. That's your look at Resurrection Man classic. 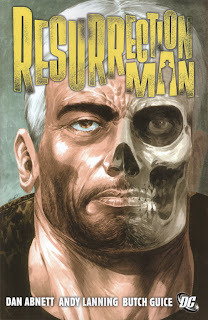 Coming up, the Collected Editions review of Resurrection Man, New 52! I really enjoyed most of the New 52 Resurrection Man and so wanted to get hold of the old run... but if they're not going to bring out a second volume, what's the point? Who wants a half-complete series? Yes, that's the problem with a number of trade series -- those who bought Infinity Inc. Vol. 1: Generations Saga, Ostrander's Suicide Squad Vol. 1, and a bunch of Justice League International volumes all feel the same way. There's a dilemma, though -- if you *don't* buy the volume, DC definitely won't publish any more because of low sales; but if you do buy it, you might end up with a "one and done" collection, unfortunately. You and me both. With the Supergirl crossover issues, if there's room. What did you like about this series? I know it's not the same thing as a TPB, but the entire series is available digitally on Comixology. I read issue #1 of the New 52 version and liked it enough to keep buying; I will continue with it through its final issue (#0, I believe). If the old issues go on sale for $0.99 I would consider buying them, but I don't want to drop $1.99 each (almost $60) on it. Although according to Amazon the list price on this old volume is $29.99? For 14 issues, that's over $2/issue! The old volume is half off at various sellers at my comic shop, which is telling people that it's not a big seller. If it were, the trade would rarely be on sale. That and it would be gobbled up in a second if there was demand, but the trade has been in the half-off bin for months. "The Ray" should also be on that list of classic 90s titles. I really wish they would have done more with him; I loved how they brought him into Freedom Fighters, but he should've been on the JSA on a more permanent basis.